It's the only route that makes sense for protected bike lanes linking Bay Ridge, Sunset Park, and Park Slope. Five years ago, Fourth Avenue was a six-lane speedway through the neighborhoods of western Brooklyn. At the time, says Council Member Brad Lander, most people thought adding a protected bike lane was “not even conceivable.” But since DOT implemented a road diet in 2012, removing a lane in each direction, crashes have fallen substantially, the traffic is not quite so threatening, and perceptions have shifted. 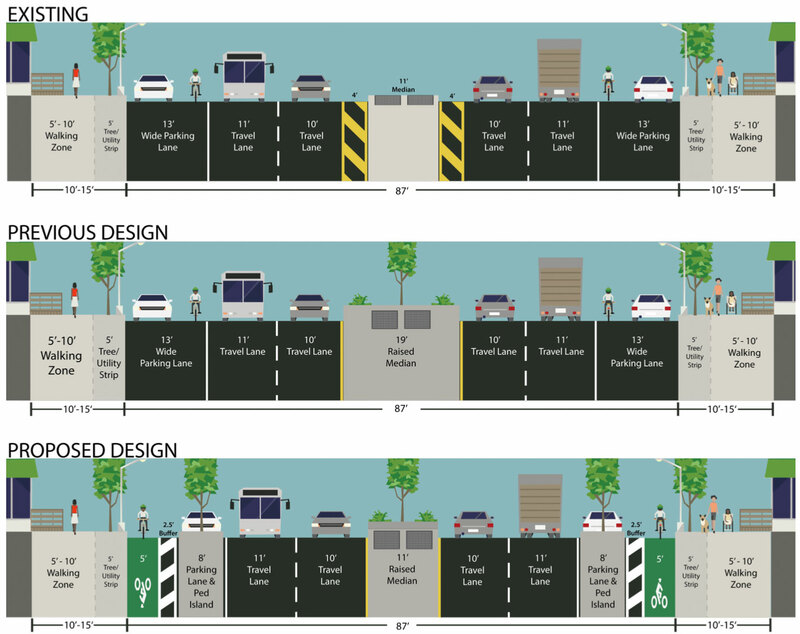 Now the city is preparing for a top-to-bottom reconstruction of Fourth Avenue, and with the urging of Council Member Carlos Menchaca, DOT has revised its initial design for the project to include curbside protected bike lanes. Last night, DOT presented the concept for the first time [PDF], getting feedback from about 80 people at a workshop at St. Thomas Aquinas Church on 9th Street. A second workshop is scheduled for next week in Sunset Park. Fourth Avenue is far and away the most viable potential bike route linking Bay Ridge, Sunset Park, and Park Slope, but it’s still scary to ride on, with no designated space for cycling. DOT Bicycle Program Director Ted Wright said last night that the agency wants to “make sure we get it right.” At 4.5 miles long, a protected bike lane would make the reconstructed Fourth Avenue one of the most important two-way streets for bicycle travel in the city, connecting dense residential neighborhoods to jobs and schools. “I’m appreciative that DOT said, ‘We’re willing to take another look,'” Lander told the crowd. “I’m supportive of the design change.” So were most of the people who showed up last night. Liz Turrigiano rides with her 8-year-old daughter on a long-tail bike from their home on the northern edge of Bay Ridge to work and school in Gowanus. She won’t bike on Fourth Avenue today, but a protected bike lane “would be a life-changer for us,” she said. 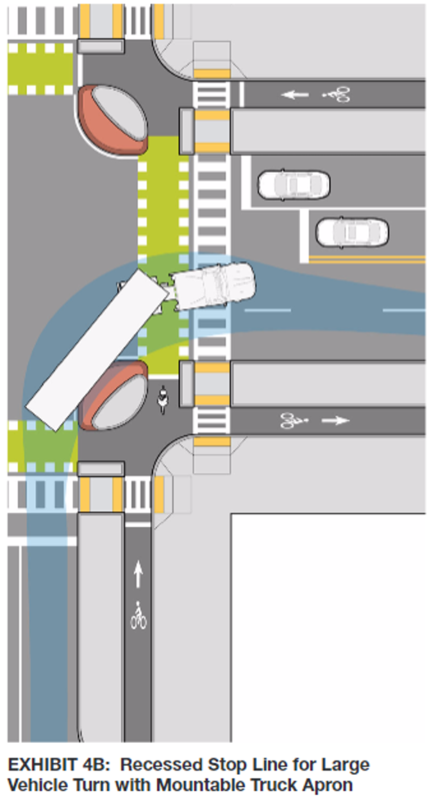 Instead of the extra-wide medians in the initial Fourth Avenue design, the new plan calls for bike lanes along the curb protected from moving traffic by parked cars. At a typical intersection, all four corners would get planted concrete pedestrian islands, shortening crossing distances and improving visibility compared to the initial design. A few other points from Wright’s presentation stand out. The motor vehicle traffic configuration — moving lanes, turn lanes, turn bans, and signals — will remain essentially unchanged. That means a northbound morning rush-hour moving lane between 38th Street and the Prospect Expressway will stay in place, limiting the physical protection and use of pedestrian islands on about a mile of the eastern side of the street. DOT may use plastic posts to separate the bike lane from car traffic on this stretch. The design is in flux on the northern blocks of the project area approaching Atlantic and Flatbush, where northbound Fourth Avenue still has three travel lanes. A recurring theme sounded by participants last night was the desire for the northbound bike lane to continue past Carroll Street. DOT showed an intersection treatment with the stop bar for bicyclists placed past the crosswalk, where people on bikes would be more visible to waiting drivers about to turn right — reminiscent of Dutch intersection design though without the full feature set of protected intersections. The construction timetable is hazy, but a 2017 groundbreaking seems unlikely. DOT will be refining its design based on feedback from the workshops, then presenting the project to the community boards along the route. Next week’s workshop in Sunset Park takes place at PS 136 on Thursday, May 11, at 6:30 p.m. DOT presentation leaves out crucial detail. The north-bound protected lane will end at Carroll St because three car lanes “need” to be maintained. The part that it is vital to get right is the concrete protective safety island. Once of the four corners is almost right. That is the upper right one in the DOT. If the concrete island were to be extended into the striped zone, and this design repeated at the other three corners, then this most important safety element would finally be done correctly. Simple solution: get rid of the parking from Carroll to at least Dean on both sides of the street and turn it into a jersey-barrier-protected bike lane. If that’s too much for people to bear, institute a rush-hour parking ban and have that space just be a termporary curbside lane. Other than that, this is an OUTSTANDING plan. The protected intersections are a game-changer and will hopefully lead to them being installed in other locations. Lots of thanks to DOT’s Ted Wright for a great presentation last night and to Brad Lander for being so flexible and understanding as the design for 4th evolved. In typical DOT fashion, they are slowly dipping their toes into Dutch design (which is good! ), but they are adopting one element at a time at a maddeningly slow pace. It’s a real shame they can’t just copy good proven designs wholesale. But no, NYC is “different”, so they must test each element individually, eventually adopting Dutch designs after 25 years of trial and error modifications that wind up showing that Dutch designs actually do work best. Yep, DOT absolutely REFUSES to just adopt best practice. This needs to stretch into Bay Ridge from 65th all the way to the water. It’s a no-brainer. Interestingly, the Dutch are doing away with these kinds of junctions in many cases, in favor of roundabouts. And the Swedes and Danes were never much into Dutch junctions, favoring raised cycle tracks with bend-ins at intersections. This is pretty close except for not having left turn boxes/bike refuges at the corners or the center islands. I’m fairly sure they’ve substituted paint for concrete on some portions of the corner because there’s only one lane on the side streets here and FDNY fire trucks need the extra room to make the turn. how much does the parking cost ? So what will the design actually look like between 38th Street and Prospect Ave? If a huge chunk of the route is going to have a different typical design, it would be nice to see what that design will be. : get rid of the parking from Carroll to at least Dean on both sides of the street and turn it into a jersey-barrier-protected bike lane. How about wherever there is a turn lane too to make room for a median refuge and put in some concrete to keep cars from making aggressive left turns off of 4th. Yes, that is true. But can you imagine the response to a proposal for a roundabout at this intersection? Even second-tier Dutch infra will be a big step forward. I thought it was not possible to plant trees in the median of Fourth Avenue because the shallow-cut subway tunnel is right beneath the roadway. What’s the plan for 65th St. end of the bike lane? Are there any plans to connect it to the protected Owl’s Head Connector/Sunset Park Greenway project that was approved a year and a half ago (maybe via 60th St.)? I hope whatever they decide to do prevents the 72nd precinct from turning it into a parking lot. Page 21: ” Other major streets appropriately handle majority of through-traffic.” DOT is assuming that traffic is a constant. Under the principle of induced demand, traffic should actually DECREASE to match the new level of supply. Is it me or does the street width for the proposed design not add up to 87′ like the existing and previous design? I get 84′ on the proposed. Nope. That would require some thinking about networks, which DOT has so far no seemed very interested in doing. Hence the Delancey Street bike lane that ends a few blocks shy of Christie Street, the 8th Ave bike lane with massive gaps, the still incomplete 2nd Ave bike lane, the Amsterdam Ave lane that connects to nothing on either end, etc etc etc. It will take a separate project and another 5 years to actually connect this to other protected lanes and paths. The new medians will be higher and can accommodate some tree pits. Nope, DOT is just being lazy. Turn aprons allow larger trucks to make the turns you describe while still discouraging high speed turns for most vehicles. They require a full concrete build-out (i.e. capital investment), but this is a capital project anyway, so it shouldn’t change much. This design is discussed in a bunch of design guides, like this one from Massachusetts. You’d think the DOT would be aware of such things. Yet another instance where convenience of people in cars trumps the safety of people on bicycles. But “Vision Zero”, right? First of all, it is great that we are getting protected lanes here, I was afraid that the we were going to lose our opportunity for a bike facility. But, what I don’t understand is why this constitutes a “capital” project. Other than the rebuilt median, we get a lot of paint and the same protected bike lane build out as the DOT SIM team provides. Though I am concerned, in light of Allen Street, that a capital grade protected lane would be royally screwed up, it would be nice to see DOT create a more permanent facility. Or maybe continuing the proposed configuration with a curbside bike lane North from Carroll to Dean (or to 4th Ave), but making the parking lane a travel lane during rush hour. This is correct. If we are forced to compromise, it should go to Bergen/Dean at a minimum. I guess the question is whether or not DOT could use some of their quick-fix materials to get going on this right away instead of waiting for DDC to start, which would take forever. Feels like there’s no reason why DOT couldn’t do the outer edges of 4th – bike lane, ped islands, etc. – and leave the median build to DDC. It would be great if DOT could actually proactively add protected bike lanes, instead of only reacting to community requests. Case in point: very similar designs on Broadway in Manhattan, Adam Clayton Powell in Manhattan, and Grand Concourse in the Bronx that completely ignore people on bikes, despite having the space to safely accommodate them with protected bike lanes. They probably need the capital money to do this many islands at once, even if they’re of the type that could be poured in-house. You’re totally right though, for a few hundred million dollars it would be nice to get something that could actually be called a cyclepath rather than another bumpy tilted ride in the gutter. If I live near 4th Ave and want to support the addition of the protected bike lanes all the way to Atlantic, who is the best person to contact about that? Is it my city council member, the community board, the DOT or someone else? 4th is a block away from 3rd, which is a 6 lane road topped by a 6 lane interstate. The idea that it is needed for through car traffic is completely insane. It really makes sense to limit the median size. However, as the picture shows, you don’t really need an apron. All you need to do is push the cars out of the intersection so the truck can use the left lane. This week DOT continues its series of public workshops on the plan to add protected bike lanes to Brooklyn’s Fourth Avenue, which connects Bay Ridge, Sunset Park, and Park Slope. This week's marquee event is Wednesday, when Brooklyn Community Board 7 is expected to vote on protected bike lanes for Fourth Avenue between 65th Street and Atlantic Avenue. If DOT Doesn’t Add a Bike Lane to 4th Avenue Now, How Long Will It Take? DOT will present a redesign for Brooklyn's 4th Avenue with protected bike lanes from 65th Street to Dean Street. It's an important shift from earlier plans that called for casting the current street design in concrete without adding bike infrastructure.